CENTRAL MINE EQUIPMENT COMPANY 4215 Rider Trail North, Earth City (St. Louis), Missouri, 63045 USA Phone: 314-291-7700 1-800-325-8827 FAX: 314-291-4880 E-mail: info@cmeco.com Website: www.cmeco.com ® Rubber-Tired, Tried and True The CME-750X is the culmination of over 30 years of experience in ATV drill technology. It's been designed and refined from the ground up to provide the best combination of mobility and drilling performance you can get with a rubber-tired all-terrain drill rig. There are no compromises. All-terrain means you can get to jobs inaccessible to truck-mounted rigs without building costly access roads. And with its built-in auger racks, toolboxes, and water tanks, the CME-750X carries everything you need to get the job done when you get there. Of course the rubber tires won't damage most pavement, so you can use this rig on city streets as well. The dependable mechanical rotary drive is available in standard, high-torque, or high-speed models. The high-torque version provides up to 12,950 foot pounds of torque while the high-speed model gives you spindle speeds up to 930 rpm. And 30,000 pounds of retract force let's you take on those big drilling jobs. The CME-750X is available with the same options as our truck-mounted drills, like automatic SPT hammer, hydraulic rod holder and breakout wrench, quick mast disconnect, various hydraulic hoists, and many more. 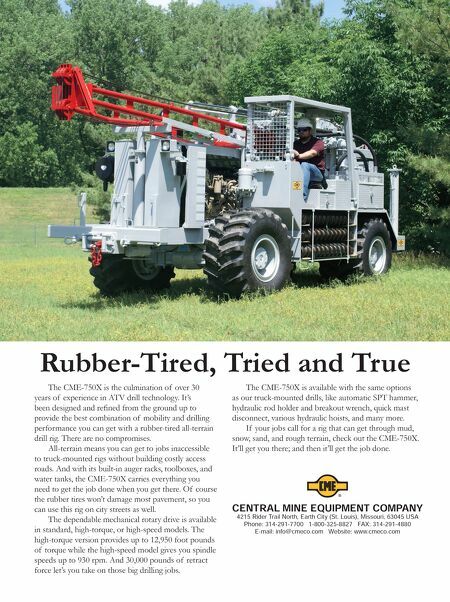 If your jobs call for a rig that can get through mud, snow, sand, and rough terrain, check out the CME-750X. It'll get you there; and then it'll get the job done.